Srinagar, Mar 5, : Lt Gen YK Joshi, General Officer Commanding Fire & Fury Corps visited forward locations in the Siachen sector on Monday, an army spokesman said in a statement. He said that the “Corps Commander reviewed the security situation and was briefed on the operational preparedness being maintained in the sector. 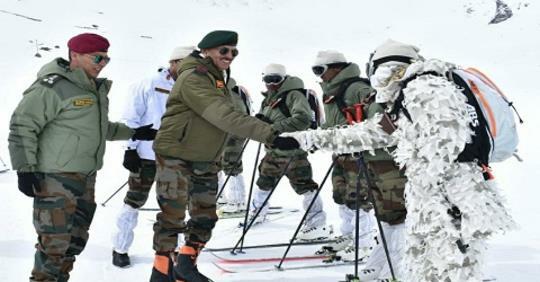 “He met and interacted with troops deployed on the highest battlefield in the world, in extreme weather and highly challenging terrain conditions, for maintaining the sanctity of Indian borders,” said the spokesman.